Our post-holiday work has us starting to focus on where we’re headed with the future of badges. And we’re also considering where we’re headed with web literacies as a standard. This may seem simple and rather obvious, but we have been continually learning about what we thought would make sense and what other people think make sense. We’re iterating in the classic Mozilla sense but that iteration does not come without significant work plus significant reflection on that work. The act of reflection can be difficult to implement particularly when you’re moving so quickly in so many different areas, but it’s essential. We recommend that everyone who’s interested in successful badge system design find the time to make this happen: your work will benefit from it. For a while now I’ve been chatting with folks about Open Badges, listening to them mentally tackle the idea of a difficult concept—one that challenges a lot of assumptions and established social concepts. While we’ve made a good deal of headway with sharing the idea of open badges and have been basking in the glow of successes, there are still a number of folks who are befuddled about badges. In addition, other people are stymied about why we would want to challenge the existing systems. So that brings us to the question of where are badges headed? 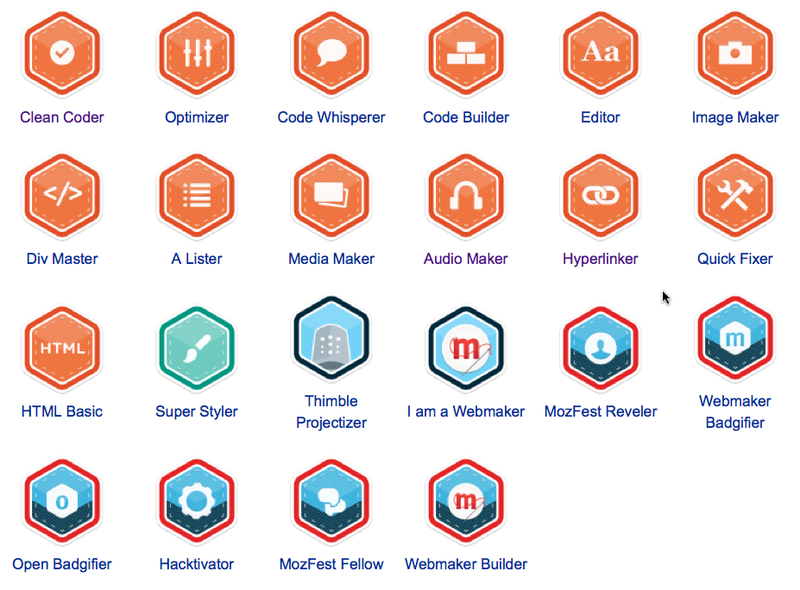 Webmaker badges are headed toward integration with the larger maker world. That and interconnectivity with the larger badging world. I find myself repeating this quite a bit: Webmaker badges are part of a larger world and we aim to be a node within it. This is linked directly to our approach with Open Badges; in particular with the standards alignment tag option that we’re proposing be added to the badge metadata (more on this in the coming weeks). So web literacies: what about those? We’ve been keeping a holding pattern on them for a bit. As we move forward with standards and other efforts, we will review these in closer detail. No doubt, as more folks get involved with this thinking, we’ll end up revising some of our content. We work in the open but we don’t always have a large enough pulpit for us to get enough feedback—or we have to wait until we get enough cumulative feedback for it to be resonant for our work. We’re beginning to get enough traction to know what our next steps might be. First a quick note of thanks to Doris Yee of GOOD Magazine and Tara Brown of LA Makerspace for hosting a badge design event on Sunday, January 13th. A number of kids and adults showed up with laptops and ideas and many new badges were designed. I was pleased to be in attendance to talk about Open Badges at such a fun event. This week also saw the launch of some of the work we’ve been doing with Lady Gaga’s Born This Way Foundation. Working in conjunction with many other organizations on the Born Brave Bus Tour, we’ve shepherded the development of their nascent badge system and helped to create some Webmaker activities where you can earn Webmaker Badges. Additionally, earlier in the month, we began working on a vast, city-wide badge system design (we’ll let you know which one soon), helping to focus and coordinate approaches and efforts. This is a huge undertaking and we’re pretty thrilled to be working on it. 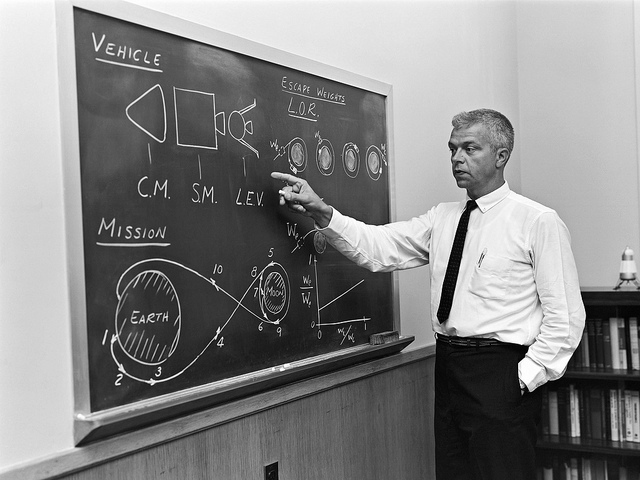 This endeavor will provide us with the opportunity to test some of our theories about badges, their uses, and audiences. Thrilling! We’ve also been coordinating and attending public calls run by our amazing community members, one of which focused on Open Badges in learning and another that addressed recent COPPA changes and related considerations. We’re also closing in on the final Digital Media and Learning Competition face to face meeting in Irvine next week. HASTAC has been our indefatigable partner during all of the DML work and we’re happy to be working with them to guarantee that our next get-together is both rewarding and fun. During the upcoming F2F, we’ve invited a number of content experts to review the teams’ approaches to design, marketing & PR, learning content and tech. Should be great! And of course, we’re continuing to forge new pathways with our web literacies thinking as well as begin to flesh out the next iteration of Webmaker Badges. I will write more about this as we progress. I welcome your thoughts on any of what’s written here but most certainly on the last two items, so please share where you’d like to see us head next. It’s an exciting time to be thinking about and working on badges. This entry was posted in Badge System Design, DML Competition, Legal, OBI, Open Badges and tagged badge system design, community, dml competition, dmlbadges, legal, OBI, openbadges, software, webmaker, webmaker badges on January 20, 2013 by carlacasilli. Happy New Year, triskaidekaphiles! I’m starting off the year with a series of blog posts about where 2012 took us and where we will be headed in 2013. This year will see the implementation of a variety of Open Badges systems, along with Displayers, Backpack Providers, as well as some Open Badges platforms—many of which will be emanating from the 2012 DML Competition, Badges for Lifelong Learning, and many of which were inspired by that competition. We are excited about all of them. It’s always fun to see many different theories tested by actual application. Rubber, road, and all that. In this new annum we will begin to see a dramatic increase in the number of badges being issued, although it’s fair to say that we’re doing pretty well so far. Last count (Jan 2013) saw a total of 40,000+ Open Badges already issued. We like that number a lot! But still, we’re shooting for much higher. As we have been saying for a while now, learning happens everywhere—it’s happening somewhere right now and a number like 40K badges doesn’t begin to capture all of that learning. Among other great things like interoperability and transportability, the Open Badges initiative can help to ensure that the massive amounts of unacknowledged learning that happen all the time have a shot at finally being acknowledged. That’s where we’re headed with Webmaker Badges: capturing the learning that envelopes webmaking. We propose to expand our Webmaker efforts over the next year by expanding our offerings, developing new partnerships, and developing a more refined conceptual framework for the Webmaker Badges universe. But I’m getting ahead of myself. Let’s take minute to recap how we arrived at this spot today. And that involves examining the fascinating intersection of Webmaker and Open Badges. 2012 saw us begin to develop our Webmaker effort. Our aim: shifting people from being mere consumers of the web—or as Mitchell Baker more eloquently described it, pushing people beyond “elegant consumption” to creative making and imaginative exploration. Our Summer Code Party initiated the experience; it began with a fun Weekend of Code and continued with a variety of events throughout the summer months. MozFest revealed to us some of the fruits of this labor. To kick off Webmaker, we started out by creating a series of exercises that were simple but compelling. We sought to test levels of public interest as well as our ability to carry this effort off. Turns out Webmaker was a hit: the public at large was thrilled to learn code in simple, free, and open ways. They were also interested in teaching each other code. Our endeavors were richly rewarded with interest and participation beyond our expectations. Webmaker proved to be deeply informative and continues to prove to be so: we learned about different coding efforts, developed new partnerships, discovered people interested in creating and coding their own projects. We had hit upon a direction worth pursuing. Before we even introduced Open Badges to the world, Mozilla shied away from creating our own set of badges. While this may have seemed strange, this was a canny act in that it let others create taxonomies and develop systems that were unusual, new and dynamic. Our act—or really, non-act—encouraged folks to build from scratch, to seize the opportunities inherent in a brand new system and begin to acknowledge things that had not been possible to acknowledge previously. The newness of the Open Badges system permitted bottom-up forms of recognition, in addition to top-down forms. Heck, it even nicely accommodated inside out forms of recognition. Its protean dynamism allowed deeply different representations of learning that were not constrained by federal or state mandates. Indeed, Open Badges help organizations to create their own pure standards that are far and above current closed, formal standards. In other words, Open Badges presented a possible sea change in representations of learning. Once the sea change was well underway—thousands of badges were being issued and many different badge systems were being developed—we felt comfortable that if we developed a system, it would slot in easily without overwhelming the nascent ecosystem. It wouldn’t become the assumed de facto badge system. We could enter the ecosystem without fear of becoming the apex organism that squelched alternative types of badge system design creativity. And so we launched a series of mini-badges based on our web literacies (much more on this in a later post) in late 2012 at MozFest. There’s obviously much more to say about our initial offering of badges and I’ll do so in following posts but let me leave it at this: we’re already underway developing Mozilla’s constellation of Webmaker Badges—large and small—and we hope that you will help us to build a complete webmaker galaxy. There’s room enough for all of us. Opportunities abound. Pathways have yet to be forged. It’s an exciting time to be a webmaker and I hope you join us on this mission. This entry was posted in DML Competition, Mozilla Learning, Open Badges and tagged dml competition, drumbeat, identity, learning, MozFest, mozilla, OBI, openbadges, webmaker, webmaker badges, webmaking on January 8, 2013 by carlacasilli. After reviewing the work from the last post, it seemed that multiple graphics that provided different lenses with which to view our efforts was the way to go. Also, we received some pushback on our view of the ecosystem from the folks at Digital On-Ramps. That’s exactly the sort of community interaction that extends and builds the conversation and we deeply appreciate it, thanks! Now, given that excellent effort, I ask you to consider and share your perceptions of the Open Badges ecosystem, not only as we imagine it right now but as you see it in 6 months, 1 year, 3 years, etc. Aaaaand, can you imagine additional alternative credentialing occurring and what’s the state of the workforce development movement? Okay, with that mental exercise assigned, let’s get to more visuals. First up, a slightly revised graphic showing the traditional/non-traditional vs. accredited/non-accredited landscape. You’ll note that the confusion introduced by matching traditional/non-traditional with formal/informal is now gone. Also, there are more organizations included in this version. Thanks to those of you who provided me with information about where they saw themselves fitting, along with areas that were previously not considered, for example the entire Maker movement. While there is some clustering happening already, I anticipate that eventually we’ll need the ability to enlarge this view dramatically because there are many groups and organizations that will be heavily clustered in some areas. That said, it’s worth noting that there are some data deserts in this graphic, too—particularly in the northeast quadrant. Perhaps this is due in part to accreditation being a pretty binary achievement (more on this in another post later). The next graphic addresses the formal/informal environment vs. standard/experimental pedagogies. It’s new and again, a rough version of where things seem to be aligning. Here I’m contrasting a somewhat old world approach to teaching including formal requirements associated with physical placement (like seat time) with the new world order linked to the anytime, anywhere learning being engendered by the rapidly proliferating self & peer based learning sites that can be found on the Web. There are some interesting overlaps occurring particularly in the southwest and northeast quadrants, especially as we consider the influence of the Maker movement. I would love to hear feedback on whether this graphic lens makes sense of this space, as well as if splitting traditional/non-traditional from formal/informal resonates with the community. For me, these are two different approaches that have been traditionally tightly interlaced but one that the web now compels us to recognize as potentially separate actors in the system. By the way, if you click on these graphics, they’ll open in a new window in a larger format so you can view them more readily. As I mentioned earlier in this post and last week’s post, I will be following up these thoughts with visuals that explain the direction that a trust network may take once Open Badges hits them. Until then, please provide your thoughts on these interpretations or directions you’d like to see expressed in a more graphic fashion. And lastly, thanks for all of your feedback on the graphics and ideas in the last post. I mention this frequently, but since it underpins everything we’re doing with Open Badges—and really, Mozilla in general—I’ll mention it again: you, the Open Badges community, are an essential part of building this ecosystem. All of your questions, notes, comments, RTs, likes, concerns, etc. inform the process. So, thank you and please continue to send them our way. This entry was posted in Badge System Design, DML Competition, Mozilla Learning, Open Badges and tagged creativity, dml competition, drumbeat, learning, mozilla, OBI, openbadges, social networks, software, tools, webmaker on August 7, 2012 by carlacasilli. It’s been a while since I’ve posted an update about our work on the Mozilla Open Badge Infrastructure: we have had our heads down working on making it the best possible system for a while. Here’s some insight into what we’ve accomplished thus far and where we’re heading in 2012. First of all, a thank you to those who have not only expressed interest in our efforts but have worked to help us find ways to make it better. We’ve been lucky enough to have some of you work directly with us; we look forward to having even more of you do so in the future. Your enthusiasm and commitment feeds our work. Second of all, a hearty thank you to everyone who has started imagining the rewarding possibilities of a future with Open Badges in it. The MacArthur Foundation’s 4th Digital Media and Learning Competition, Badges for Lifelong Learning, has provided us with the opportunity to interact with a wide variety of folks. Through it we’ve discovered nascent badge systems, well-developed badge systems, strategic assessment platforms, deep interest in alternative learning environments, and a variety of long-range goals. Perhaps most importantly, the DML competition has helped to enliven the conversation about alternative assessment and recognition of learning. We are tremendously excited about the three different competitions (Research, Badges, and Teacher Mastery), two of which (Badges and Teacher Mastery) will culminate at the DML conference in the beginning of March. You can see all the winners at the Mozilla Science Fair. Undertaking something as significant as proposing and building an Open Badge infrastructure—with all of its attendant direct and indirect meanings—continues to prove to be a humbling and rewarding experience. As the Open Badges team engages the public to work with us to test this hypothesis, we’re learning a huge variety of things. Some of these things seem obvious in retrospect, and some seem surprisingly hidden, but this is the learning process, and we’re committed to it. As the Open Badges website states, we’re interested in capturing learning that happens anywhere at any time. Consequently, we aim to keep on learning, modifying, adjusting, and recalculating as we go. We’re listening to your comments and we’re excited by your enthusiasms. We’re doing this to reimagine what learning can be. What’s nice about the entire experience is that we are stepping through the same process that others will experience themselves. The past few months have been revelatory: we’ve made new alliances, we’ve discovered possibilities for extensions of our work, and we’ve found eager audiences. As we continue to move forward, we run towards, stumble upon, back into, and greet with open arms new opportunities, like improving ease of use for the backpack or reconsidering our website (a full-on redesign is underway). If you’ve been wondering what else is in store for 2012, please take a look at our newly modified roadmap. The first quarter of this year will see us posting Issuer APIs, Displayer APIs, and a rough cut of an Endorsement API. Looking at the immediate future, members of the team are about to kick off a week-long development sprint in New York City, speak at the Connexions conference in Houston, attend the DML conference in San Francisco, and then attend SxSW Edu in Austin. In addition, we’ll be conducting a webinar for Open Education Week on March 6th (more details to follow). We hope to see you at these events. And if there are other events you think we should know about, please drop us a note. 1) We now have an Open Badges community call every Wednesday at 9:00am PST (-08 UTC). You can learn more about that call, including the local and international dial-in numbers here: https://openbadges.etherpad.mozilla.org/openbadges-community. 2) If you are not already a member of the Open Badges conversation area/google group/mailing list, please join: https://groups.google.com/forum/#!forum/openbadges. There you’ll find a rich history of software questions, notices of documentation efforts, philosophical considerations, and references to github repositories. This entry was posted in OBI, Open Badges and tagged dml competition, dmlbadges, drumbeat, mozilla, openbadges on February 12, 2012 by carlacasilli. Mozilla is collaborating with the world to develop an open badge ecosystem. What, might you ask, is an open badge ecosystem? Well, it’s a system that recognizes learning no matter where it occurs, whether it’s someone sitting alone in their room learning html from a peer-based learning organization like Peer to Peer University, or someone separating from the military getting recognition for their prior learning, or a non-traditional student taking an open education sociology course vetted by a prestigious university like Parsons / The New School. We are building the core infrastructure technology for a digital badge environment that will support a variety of badge issuers—groups, organizations, academic institutions, or individuals who have developed assessment criteria and want to award badges to individuals as representations of their experiences or competencies. They can address both hard skills and human or soft skills. And we hope that you are as excited about this new possibility as we are, and that you’ll help us build this brand new world. Experiment with us through the Digital Media and Learning competition: Badges for Lifelong Learning. Stage 2 is now underway. Join today’s webinar Thursday, December 15 at 1pm Eastern / 10:00am Pacific. Check out http://dmlcompetition.net for more information about Stage 2. This entry was posted in OBI, Open Badges and tagged dml competition, dmlbadges, drumbeat, mozilla, open source, software on December 15, 2011 by carlacasilli.